Google offering so many products/Tools that we are using and are very useful for every one. Some of those are Gmail, Blogger, Google drive, Google sites, google+ and some webmaster tools for webmasters etc. And for all those you need only one account i.e one Username/password. And another service is ‘Takeout’ which can be used to download a zip archive of all the google profiles data. 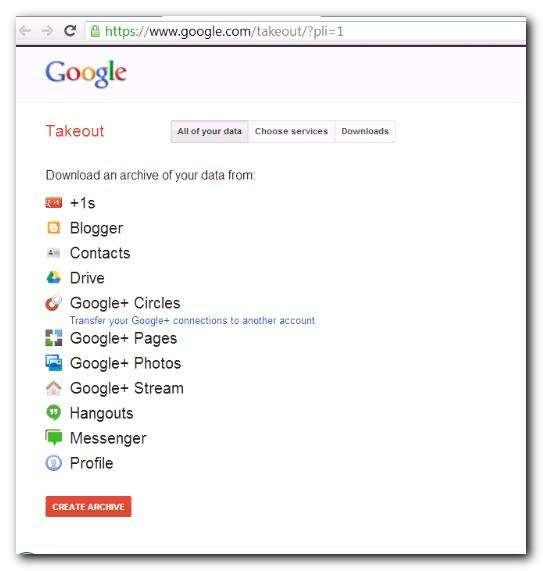 Downloading google profiles data using Google Takeout is very easy, as we are discussing this in the post. Google takeout allow you to download your all profiles data or just selected profiles data its on you what you need and want to download. 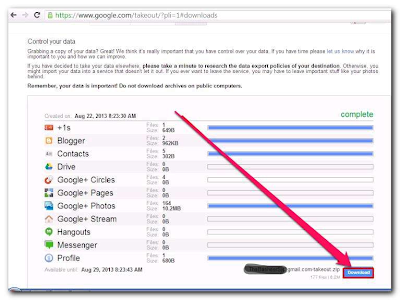 Anyway, if you want to do so then follow the below steps, you will able to download your google profiles data. STEP-1: First of all go to this link (Google Takeout) this will take you to a website where all of your google profiles data are saved as shown in the below image. STEP-2: Now if you want to download all of google profiles data then you click on "Create archive" And then wait a moment, Or if you want to download one of your google profiles data then you have to click on "Choose services" tab, So here you can select a profile you want to download its archive (I,e Gmail) and then click on create archive. STEP-3: After clicking on create archive, wait a moment (Let google collect your information) you will see your data information (With Files and size), and at the right bottom you will see a ‘download’ button so click on download. Google may ask you to enter your password once again for security check so enter your password once again. Downloading of your google profiles data will be started and you will see a file in your "downloads folder" named as your Gmail account name so double click on this file and open what is inside it!.